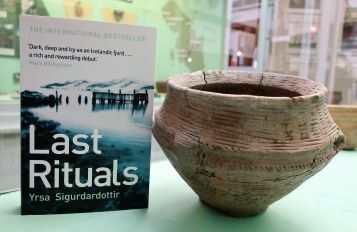 No.6 in the series – ‘Last Rituals’ by Yrsa Sigurdardottir meets a Bronze Age food vessel. The last rituals for the Bronze Age residents of Bute would be burial with items such as this food vessel found in a cist at Little Kilmory. The Museum has a superb collection of Bronze Age artefacts, including the fabulous jet necklace buried with the Queen of the Inch.